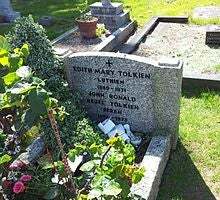 Did you know that the gravestone of J.R.R and Edith Tolkien have the names of Silmarillion heroes Beren and Luthien engraved on it? From The Wiki That Was Broken. This did not sit well with the authority back home. His guardian, Father Morgan, viewed Edith as the reason for Tolkien’s having “muffed” his exams and considered it “altogether unfortunate” that his surrogate son was romantically involved with an older, Protestant woman. He prohibited him from meeting, talking to, or even corresponding with her until he was 21. He obeyed this prohibition to the letter, with one notable early exception, over which Father Morgan threatened to cut short his university career if he did not stop. I had to choose between disobeying and grieving (or deceiving) a guardian who had been a father to me, more than most fathers ... and ‘dropping’ the love-affair until I was 21. I don’t regret my decision, though it was very hard on my lover. But it was not my fault. She was completely free and under no vow to me, and I should have had no just complaint (except according to the unreal romantic code) if she had got married to someone else. For very nearly three years I did not see or write to my lover. It was extremely hard, especially at first. The effects were not wholly good: I fell back into folly and slackness and misspent a good deal of my first year at college. Tolkien eventually decided he wanted to marry Edith but by then she was betrothed to another. On the evening of his 21st birthday, Tolkien wrote to Edith, who was living with family friend C.H. Jessop at Cheltenham. He declared that he had never ceased to love her and asked her to marry him. Edith replied that she had already accepted the proposal of George Field, the brother of one of her closest schoolfriends. Edith said, however, that she had agreed to marry Field only because she felt “on the shelf” and had begun to doubt that Tolkien still cared for her. She explained that, because of Tolkien’s letter, everything had changed. Edith had a dream that Tolkien would write a hugely successful book about short people with hairy feet and thier jewelry and decided to go ahead with the marriage....Ok i’m kidding that didn’t happen. However, her friend Mr. Jessop was not a fan of J.R.R. What’s the word i’m looking for....what is it? Edith Tolkien passed away on November 29th, 1971. According to Simon Tolkien, Christopher’s son and J.R.R’s grandson..
Edith was the source of inspiration for the Beren and Luthien story but he never called her that. If you live in England or might be going that way, here is the information on how to find Wolvercote Cemetary at Oxford where the Tolkien’s grave is located. Now if you do not know the story of Beren and Luthien.....well your screwed. Ok not completely. Here is a good summary from Wikipedia. The entire tale can be found in the Silmarillion. Keep in mind the Sil is advanced Tolkien, more akin to The Bible than LOTR. I highly recommend reading it, it’s a wonderful series of tales. Just know it’s a much different structure and layout than a novel like Lord Of The Rings. Now with that, I wish you all a pleasant.....evening on this very late FOTD. I will do better tomorrow, where I will see you all bright and early for the Friday Fact Of The Day.